He was born to a family of intellectuals in Gushchular village of Shusha region on the 16th of April, 1967. Rizvan worked on a state farm after finishing secondary school in his own village. He was called for military service in 1985 and served in Omsk city. After he was demobilized from the army, Rizvan retuned back to his own country. Soon he again left his own home but in the search of job and this time he ended up in Ankhangelsk province of Russia in 1987. But when the undeclared war started by the vicious enemy, the desire to protect what is rightfully ours made him return back again. Thus, he worked as a catering person for a while in his own region. When the Special Police Force was established in Shusha region, he was from the first ones to sign up without any hesitation. The brave soldiers who had no fear showed a real example of bravery and courage when protecting Garadaghli, Sirkhavand, Umudlu, Meshali, Jamilli villages and also Khankendi region from the enemy invasion and as well as the disarming of the enemy too. Rizvan Teymurov was all over Garabagh and fought bravely in the battles near Khankendi and Karkijahan regions. The 9th December, 1991... the last battle of the barve fighter...Rizvan was about to start the opreation against the enemy early in the morning. He was supposed to have a rest before the operation. Though it was late at night, he could not sleep and have rest. Thus, Rizvan decided to visit his battle friends in Karkijahan. But the enemy suddenly attacked during the night.When the enemy militants saw strong resistance tey had no choice but to retreat. Alas! The brave soldier heroically died during this battle near Khankendi and Karkijahan regions. 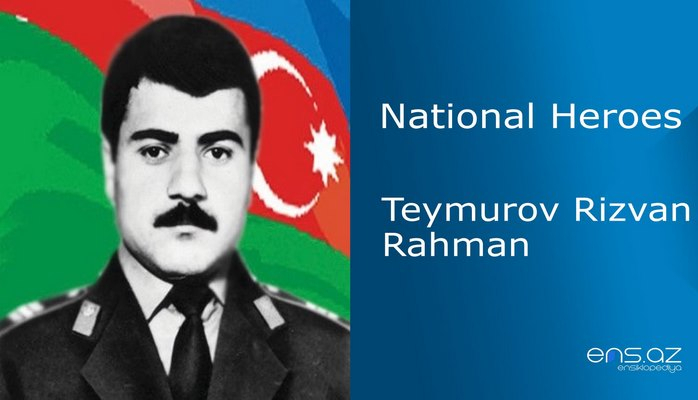 Teymurov Rizvan Rahman was posthumously awarded the title of the “National Hero of Azerbaijan” by the decree # 264 of the president of the republic of Azerbaijan on the 8th of December, 1992. He was buried in Gushchular village of Shusha region. One of the streets in Nizami district of Baki city is named after the hero.